How often do you consciously monitor the way you act around new acquaintances? You may offer a firm handshake, but do you make eye contact? Do you introduce yourself politely and clearly, or do you slap hands and say “Sup, bro? I’m Jake”? If you do this wrong, you could find yourself paddling upstream, attempting to land in the good graces of your new acquaintance. There’s nothing wrong with waking up from a night on the town and throwing on a rumpled T-shirt, last night’s jeans and a ball cap to make a Starbucks run. However, those jeans you’re putting on ought to go over a fresh pair of underpants, and that T-shirt should have a new coat of antiperspirant underneath it, even if you haven’t showered yet. There’s no excuse for leaving the house with your teeth unbrushed, nails untrimmed, and hair unkempt (or at least uncovered). While you may not care what the barista thinks of your appearance, you never know who you might see. Almost nothing can turn around a bad first impression, but a bad second, third, or fourth impression can sure as hell erase a good first one. We’ve all been there: Maybe you’re seeing someone casually, or have just begun a relationship, and you see a woman who makes you do a double-take. Assuming you don’t have your lady friend in tow, sooner or later events conspire to make it such that the two of you have struck up a conversation at the bar. Assuming you’ve made a good first impression and have some modicum of charm, inevitably the talk turns to relationship status. When the question comes up, what do you do? If you’re any kind of a gentleman, you come clean and be truthful about the fact that you’re seeing someone. That may end the conversation for her, but if she wants to carry on, so be it. Regardless, lying is unfair to your squeeze, unfair to your new acquaintance and generally unbecoming of a gentleman. In a social setting, the modern gentleman is immediately aware of the tone and setting in which he finds himself. If you’re at a $5,000/plate fundraising dinner, that shouldn’t be your cue to drink combatively and test your personal limits. On the other hand, no one likes a wet blanket. If everyone else is dancing on tables and singing off-key to Journey, unless you’re abstaining for other reasons, by all means indulge and have a good time. Whatever the case, you don’t want to be remembered as the guy who was out of touch with the rest of the party. That’s a good way to make sure you aren’t invited back. There’s nothing wrong with a little cursing here and there, and there’s nothing ungentlemanly about it, provided the context is right. If you’re with your friends or even slightly more mixed company, a swear word won’t kill anyone. But in the wrong setting, telling an off-color joke, however funny it may be to you, isn’t going to go over so well with the black, Jewish double-amputee you didn’t notice in the corner who happened to be the punchline of your oddly specific joke. In an instant, you’ll go from being the life of the party to a member of the untouchable caste. It’s fine to call Aaron Rodgers a “f*cking jackass” (because he is) when you invite your college buddies over to your house to watch football. It’s not so fine when your boss invites you over to his. Yes, this is an old one, but a good one. If you’re going someplace and you’ll be staying a while, take your hat off. It just shows a little respect for the establishment you’re entering. Don’t want to because your hair will get messed up? Too bad — in that case, you shouldn’t have worn a hat. This isn’t the 1950s, and a hat is no longer a de facto part of a man’s wardrobe. If it’s the dead of winter and you’re wearing a beanie or ski cap for warmth, don’t worry about it. Everyone else’s hair will look just as bad. If you’re out for a meal with a group, the gentlemanly thing to do is to wait for all parties to get their food before digging in. You don’t want to be the one guy shoveling food in his face while others are still conversing. Plus you’ll finish before everyone else and have to sit in silence while they finish. Speaking of which, take small bites. It’ll help your meal last longer, and you never know when you might want to jump into the conversation. The exception: If there are more than six of you, go ahead and eat. There’s no need to make others feel like they’re forcing you to let your food get cold while the waitstaff brings out eight more plates. While some things have fallen out of fashion, other stalwarts of the gentleman’s code are just as applicable today as they ever were. Let’s take a look. -Standing when women enter/leave the room: While it’s always a good idea to stand when being introduced, standing just because of a woman’s presence will come off as weird to most women. And, admit it, it kind of is. -Offering your seat at a dinner table: If your host is expecting a party of a certain number, it’s up to the host or the restaurant to ensure there are enough seats. If an unexpected female guest shows up, well that probably means the host didn’t want her there anyway. Besides, you know what’s not gentlemanly? Awkwardly hovering over a table of seated guests after you gave up your chair to an uninvited diner. -Helping her with her coat: This, on its own, is a fine idea. It’s a great gesture and it’s really adorable to see, say, a married couple doing this. However, if this is early in the dating game, she may not want you touching her stuff, and in all likelihood she won’t know what you’re trying to do. As important as it is to be gallant and kind, it’s even more important to make sure your date doesn’t feel like an idiot. -Helping her with her chair: Again, nothing wrong with the gesture itself. It’s just another one of those things that women aren’t accustomed to anymore. Besides, at a decent place the host or waitstaff usually assists with this. -Holding the door: Don’t worry about coming off as misogynistic or insensitive to her capabilities as a human being. Everyone appreciates a little hand. However, don’t make a show out of running ahead to reach the door before she does (unless she’s carrying something). In that case, simply reach over her and assist her with opening the door. Remember, she can open it herself. It’s the thought that counts. Reaching for the check: This has been discussed ad nauseum here and elsewhere, and, yes, you should still do it. If she fights you or insists on splitting it, then let her have it. Otherwise, grab it, put your card in, and don’t say any more about it. Of course, if she’s arranged a date with the intention of taking you out on the town, by all means respect her gesture. -Opening the car door: Provided you’re parked on the same side of the street as the place you’re leaving, this takes zero time or effort and reflects well on you as a gentleman. However, like with holding entry doors, don’t make a show of running around to the other side of the car if you’re parked in the other direction. If a gesture requires obvious effort and expense, it goes from being gallant to buffoonish. -Entering a cab first: Counterintuitive, but if your lady friend is wearing a skirt or dress, it’s a lot easier for her to not have to scoot all the way over to the driver’s side. -Walking on the curb-side of the street: Truthfully, if a runaway city bus careens over the curb and heads in your direction, it doesn’t matter much what side of the street you’re on. But, still, the gesture is of you putting yourself between wayward vehicles and splashed puddles. She may not even notice you’re doing it (my wife never does), but it costs you nothing. -Offering her your arm: If you’re on a first date, this could be a little dicey, so play it by ear. Look at it this way — if you offer her your arm and she takes it, that means she likes you (at least to some degree). Otherwise, it’s a classy, understated alternative to holding hands, and I can’t think of a woman who doesn’t want to be seen walking arm-in-arm with her man. Being a modern gentleman doesn’t have to be hard, and, in fact, it’s easier than ever. It’s all about self-awareness and consideration for those around you. Those never go out of style. 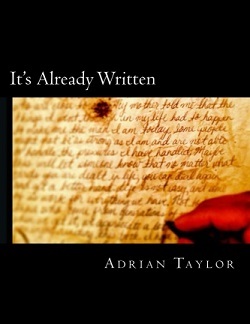 Purchase “It’s Already Written” Now!